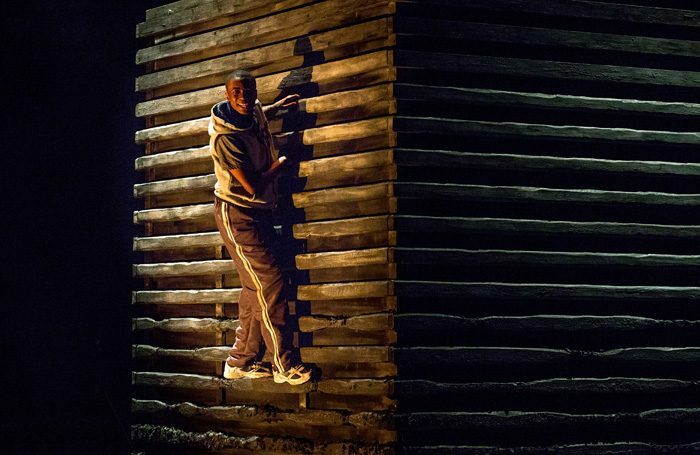 Arinze Kene’s play Good Dog is a tale that will be familiar to working class inner-city dwellers across the UK. Kwaku Mills’ unnamed Boy believes, simply, that good things come to good people. And he really wants a bike, so he does everything he can to be good. But then he grows up a little and realise his goodness is no match for the odds stacked against him. Navigating this reality is a rollercoaster. Boy has to negotiate his way through playground scrapes with the “smoking boys” and “the what-what girls”, a difficult home situation, an absent parent, a fumbling first time. His story ain’t all good but it ain’t all bad either, and Mills delivers it with aplomb. It is in the second act of Natalie Ibu’s production, which toured in 2017 and is returning following Kene’s hit play Misty, that you really appreciate the range of his acting talent. Gone is the squeaky naivety of Boy’s early years. He stands atop Amelia Jane Hankin’s towering council block set with his legs spread in the way that men do, cigarette in hand. When he speaks, his voice booms an octave lower than before. Kene’s writing superbly evokes the early noughties in its details – a time of Super Mario Bros, Panda Pops and 0171 landline numbers. His distinctive narrative voice, his use of dialect, and the cadences of his language are all exemplary. Coupled with Misty this marks Kene out as one of the most talented British playwrights around at the moment. JN Benjamin is a writer from south London.